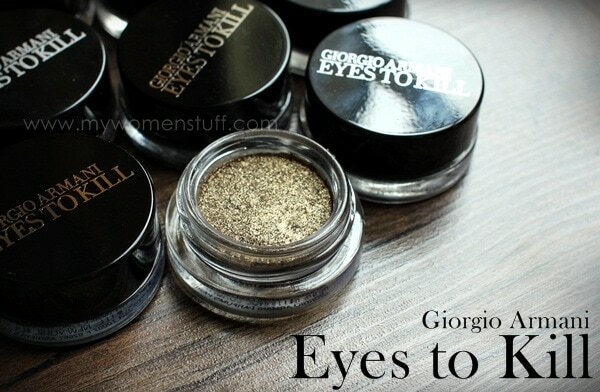 Home » Eyes » Eyeshadow » Giorgio Armani Eyes to Kill Intense Silk Eyeshadows : Absolutely worth a splurge! 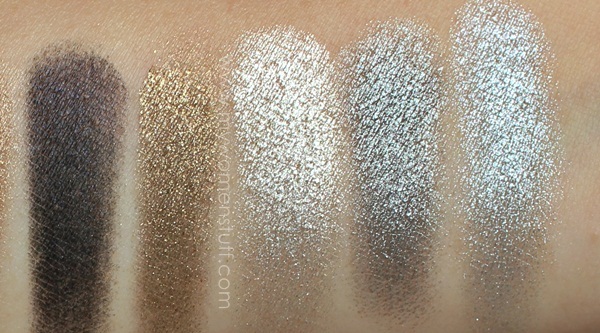 I would say that for the most part, those who dislike shimmer will not like the GA Eyes to Kill shadows. The colours are very shimmery although you can tone them down. I do not find them overly bling, the way some shadows can be, and I personally do not experience fall out either. I have read of people who do, so I would mention it for you to take note. There are at least 15 permanent shades available and GA has been releasing limited edition colours over the past couple of years. On the bright side, the permanent colours are more than sufficient for you to start your own collection and the colours are unique and interesting enough to suit most people. Some of the limited edition colours that I have been observing online seem to fall short in one way or another. Its the curse of the limited edition tag, I swear. I find that what makes the ETK special is not just the texture (I know many of you are already thinking about the L’Oreal Infallible shadows that have a similar formula) but the colours. For the most part, each pot of shadow has a complex blend of colours that is very unique and the resultant colour when applied on skin, is sometimes quite different from what you see in the pot. Also, due to the blending of the colours in the pot, you may sometimes get a slightly different hue or tone each time – love it, or hate it. I love it because this means you can quite easily just wear one colour on your lid and look like you actually took the trouble to do up your eyes. Perfect for lazy days, holidays, and when you just don’t have the time or energy to make too much effort. Each pot comes with a little lid that you can use to tamp back any loose powder and to prevent the powder from breaking up if you drop it or when you tote it around. Unlike the L’Oreal Infallible shadows I have, none of my ETK have ever loosened up in the pot, nor have they come lose even when I travel with them. It happens a lot with the Infallibles for me. From what I understand, #1, #3, #4, #6 and #13 are permanent colours. #14 was supposed to be limited edition but I picked it up from the GA counter in Hong Kong where it was still on display so I’m uncertain if its limited edition or just limited edition in some countries. #19 was limited edition from Christmas 2011 and #21 and #22 are from the limited edition Bronze collection. Here are the overall swatches of all 9 colours, with close ups and descriptions below. You can tell on an overall basis, that barring #13 Black which is matte, the rest of the colours are all shimmer colours. In fact, other than Black, I don’t think there are any other matte shades in the collection. I bought Black by mistake actually, but it is such an intense black that I don’t regret it one bit. Perfect for lining and does not dry out the way a gel or cream eyeliner will, and so easy to smoke out or blend with other colours! The shimmer is however, manageable in my view. It isn’t chunky glitter nor is it something that shines like a beacon in the dark. 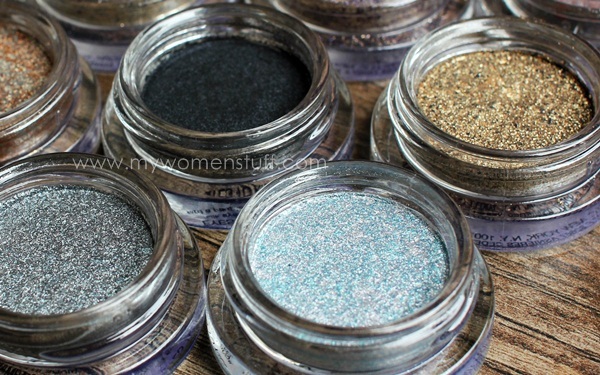 It is shimmery, but does a lovely job at enhancing your eyes with just one swipe of colour. You don’t even need to think about blending these with other shades – each colour can stand on its own quite perfectly well. #1 Blast of Blue – A deep navy blue shot through with golden shimmer and looks like stars in a night sky. Wear it on its own for best results, more intense closer to your lash line, and gently sheered out into the crease. This is an intense colour on its own. #3 Purpura – In pot, it is a deep purple with golden shimmer but when swatched, it is a cool purple warmed up by the gold shimmer. The colour can be made deeper if you layer it on and although I don’t wear purple shades a lot, this one gets a lot of wear because I find it easy to handle. I don’t wear this colour too intensely because I can risk having that “punched in the eye” look if I’m not careful. #4 Pulp Fiction – In pot, it is a strange combination of red and silver. Once applied on skin, it blends into a warm silvered taupe that is surprisingly wearable. I was afraid of picking up this one sight unseen but was convinced that it was one of the more special colours in the range. I will agree but I will also caution that too much can make you look tired so I tend to wear this as a light wash or blended with black for intensity and to deepen the colour. #6 Khaki Pulse – In pot, it looks like a warm bronze, gold and black but when applied on skin, it blends into a warm bronze. I find that there is no khaki element in this one (I associate Khaki with brown-olive shades) so I’d put this as just a straight bronze. In terms of application on skin, I find this one the least complex in terms of colour and one of the less shimmery shades. #13 Black – A straight no nonsense matte black. The colour is very intense and I find this is excellent for use as an eyeliner the way you would use a gel liner. The best part is that this will not dry out and you can double task it for use as a shadow too! A mistaken purchase that I ended up liking a lot. #14 Antique Gold – This one seems to be a mystery colour to me. I saw that it was limited edition but I picked it up with no problem at a counter in Hong Kong. In pot, the colour is bronzed gold and black and when applied, it is a lovely cool toned antique gold shade that is very easy to wear and flattering. I had problems wearing antique gold before because it tends to run warm but this shade has a slight cool tone. The black mixed in deepens the shade and makes it much more flattering than you expect and is perfect worn alone. #19 Silver Gold – This was limited edition from Christmas 2011. In the pot it is literally a mix of gold and silver colours. In the swatch, it is an interesting warmed silver color that can be worn alone but also makes a lovely highlight shade. True to the metallic nature of the name, I find this colour a little more metallic. I don’t know if you can still get this but to be honest, its not a must have. #21 Obsidian Gray – This is limited edition from the Bronze collection. In pot, it looks like a silvered gray and in the swatch, that is how it turns out. A medium toned silvered gray with blue tones and a metallic shine. I like wearing gray on my eyes so I liked this shade which I picked up online. You can easily wear this alone, or even paired with #19 or #22 for something interesting. #22 Ecailles – This is also limited edition from the Bronze collection. In the pot, it looks like a blend of teal, silver and lilac colours. On skin, it is a silvered light blue with a metallic edge. I haven’t worn both #21 and #22 as I’ve just received them so I don’t have thoughts on how they wear just yet. To apply these, you can use a brush or fingers. I tend to use my fingers but if you plan to use a brush, use a natural hair brush. 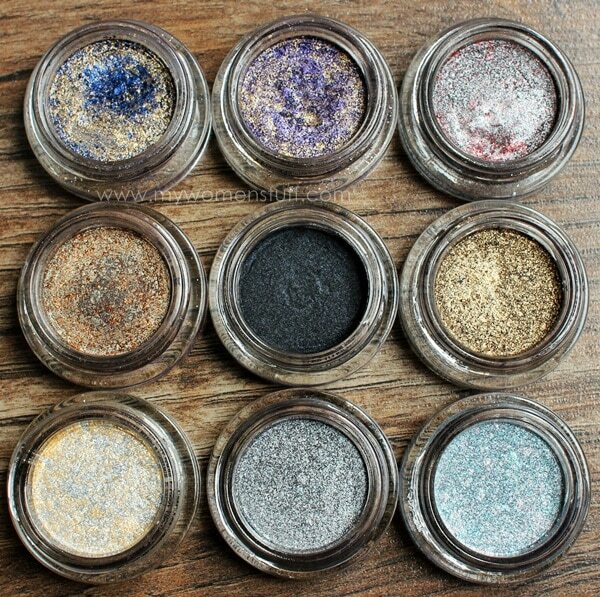 Remember that the ETK are not cream shadows and synthetic bristles can’t pick up the powder colours very well. So, use a natural bristle brush. With a brush, I find that the colour applies a little less intense if that suits your look. I tend to use my fingers because its quick and because I get good intense colour right from the get go, which is how I like it. Based on my personal preference, I chose to pick up the more intense and more interesting colours in the range. There are some light shades too which I am not keen on and a very interesting shade #2 Lust Red which is a blackened red toned shadow that many people love but which I just can’t bring myself to experiment with. Here’s just one picture of #3 Purpura worn on my lid to show you that the colour is a) wearable and b) not too intense or shimmery for the day. I applied this with my fingers. I just wore Purpura as a wash over my lid for the day, sheered out at the edges, and with liner and mascara. It looks a wee bit more intense in person but it pretty much stays this way all day. It doesn’t look that purple nor as shimmery right? Looks like a greyed purple, in fact and that is the beauty of these shadows – they just look different all the time! If you want it more intense especially for the evening, pack on the colour and the shimmer intensifies. One of the easiest shadows I have ever used. 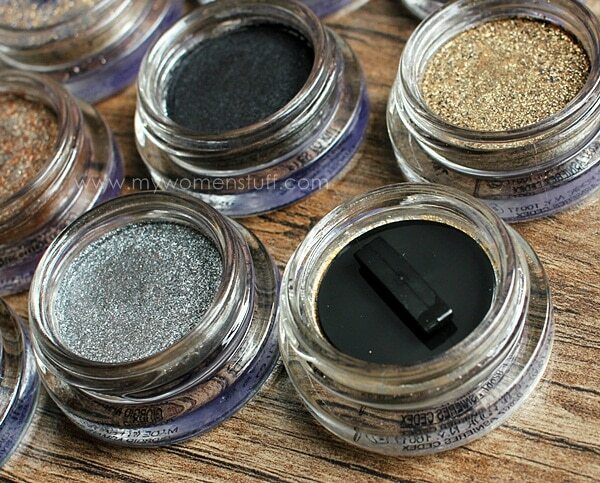 Have you tried any Eyes to Kill Intense shadows? Is this something you might like? PREVIOUS POST: Hot New Trend! Its the time of the Facekini – Burn that Bikini & Toss that Tankini! NEXT POST: Your Say: Do you care for your feet? Do you have tips on how to care for your feet? Oh great, you are giving me serious lemmings now! I own two shades and I love them so much! They are suite easy to work with and add a lot of glam too. What I love is their colour range, it’s pretty unique! I seriously envy your stash, like whoa! Thanks Teri and sorry the lemmings crept up on you LOL! 😉 Which are the 2 shades you have? I love these for everyday and for glam days too. So easy to work with! I have 26 and 14. I had to get an antique gold ofcourse, love it so much! 26 is more like a bronze shade, it’s less complex, but I love it nonetheless :). I really want to add some purples and blues to the collection now! I have #3, #14, and #25, but I’m sure my stash will keep growing! 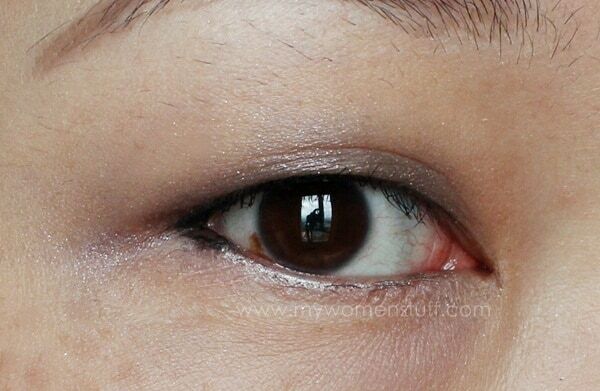 I love to use #3 and #25 wet as a thick winged-out liner when I wear my glasses. It’s a perfect way of accentuating my eye shape a little behind frames! I also reach for these when I am really running out of time. Because of the complexity, I find it possible to get away with one single shade plus some eyeliner and mascara. I know that not ALL shades are stellar, but the good ones are SO seriously good! Also, #14 is really only impossible to find out of the US (or North America in general). We don’t seem to have a shortage here, and I heard it’s entirely possible to find it in Taiwan now. I’ve never tried using these wet because I dislike it when the texture changes thereafter. Do you experience that, Sunny? I looked up #25 and that’s a gorgeous colour! I shall have to try to get my grubby paws on this one before it sells out – darn! 😛 Thanks for clearing it up about #14. I was looking up info and just so puzzled that people were reporting that it was so hard to find! Hey Paris, so far I haven’t experienced that problem and I’ve used them (especially #3 & #25) wet time and time again! I just dug them out to make sure, and I can’t even see where my wet brush has touched the surface and it swatches the same. #3 is SOOOO much better when it’s used wet. You should really try! Do you know where I can find GA counters in Taiwan? I’ve been wanting #14 for such a long time and it just so happens that I’ll be heading over to Taiwan in 2 weeks time! I own three Chanel Illusion d’Ombre shadows and I just dont use them so much plus after some months they kind of… shrank ? Im curious if these will shrink too, because these have so much more beautiful colours than chanels! I bought my first one a month ago and these things don’t crease on my lids even without a primer on. That says a lot! Because of that, and the complexity of the colours, I’m eyeing others now. I’m eyeing obsidian grey which is available on strawberry net. So tempting! I got #29. 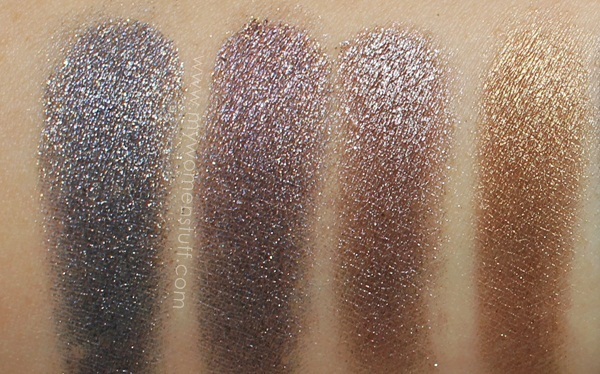 Online swatches make it look lighter but on me it’s actually black with complex shimmers. Maybe it’s because those swatches are done on darker skin tones. I like it very much nonetheless! And i hope i got the number right. Lol! I have bee literally hoarding these. I am so glad you like them too! Its like a drug LOL! Hi Paris~ I’m a silent reader on your blog for awhile now. But I decide to comment today as the colour swatch you did on your arm is intensely beautiful. I don’t normally wear shimmering eye shadows. Though I’m seriously thinking about investing in those GA eye-candy 🙂 Have you tried smokey eyes with these eye shadows ?? Do you think it would look too much ?? Sorry to hear that 🙁 Maybe you can try looking online? Or if you have friends headed to Europe, Sunny reports that its easy to get there or in Asia. Oh be still my beating heart! The colors are so pretty and lovely! However, due to my budget, I think I’m better off waiting for the Loreal Infallible to come to Malaysia heh heh heh. Hope these don’t disappear anytime soon! Such eye candy! Really like purples on you, Paris. 😀 I love how differently some shades swatch. GA is somewhat difficult to obtain in Japan, too, since we only have a single counter in the country as far as I know. Is it an easy trip from Malaysia to Singapore for shopping? Not to worry! I wanted to do Tokyo-Kyoto-Tokyo in a day and after looking at the logistics and distance, realised that it was madness. I somehow had the impression it was nearby and I took Japanese geography in school! LOL! The swatches are goooooorgeous! I was wondering where’s the blue in Blast of Blue until I looked back at the photo of the colour in the pot. Very tempting, though I think I’m more interested in seeing the transition from pot to skin than wearing it. I wouldn’t know how to dab such intense colours on my eyes! I love this! I only have 1- #5 but I do wear it quite a bit esp when I’m in a hurry as its the only thing that will not crease on my very oily lids!! These had me eating cheese sandwiches everyday for a month! I’ve got #3, #6 and #9 (Rock sand). So glad you love #3 as well – gold and purple is such a fab combination. #6 on me actually looks olive. I think I’m a similar skin tone to you (NC20?) so maybe its just inconsistencies in the amounts of different pigments across pots? I’m actually quite disappointed with #9 🙁 Its the only one out of the three I have that I experience fall out with. Plus I find it far too sparkly to use, certainly not day time/work appropriate 🙁 Personally I seem to find the over sparkles an issue with the lighter shades – would love to know what you think. Am currently very tempted with #1 but am worried it might be too obviously and unnaturally blue. I am still contemplating whether to buy or not. Don’t get me wrong I love GA makeup. I own mostly lip items and mascaras but always shied away from the pots. But after this post, I sure will go and check it again. I’ve never tried them but I think I will, they’re so beautiful. Oh S I hate it when that happens too! Snobby sales assistants really put me off and I tend not to want to give them my business. What I usually do is brave the store once, try the product and then buy online HAHA! Now that you have reviewed them and given your stamp of approval…. Dear me! =D I really like Purpura and Blast of Blue as they look so pretty and complex in the tub!